One of the questions I frequently am asked is "Are there any good deals out there?" So fresh from meeting with so many suppliers, many of whom are currently offering promotions, here you are! If you are interested in further exploring any of these offers, please let me know - I'd be delighted to match you with an experience! Why Hire a Travel Advisor? I'm writing this as the sun sets on St. Patrick's Day. Having lived in Chicago most of my life, St. Patrick's day in Southern California is comparatively low-key. But if you've harbored a hankering to visit Ireland, this is a great time to plan - one of my partners has a great air-included promotion for trips to Ireland - but this trip must be booked by March 19th. My wish for you is well stated in this Irish Blessing: May your troubles be less, and your blessings be more, and nothing but happiness come through your door! How Can A Travel Advisor Help You? Fast forward to earlier this week, as they left for Spain. I was monitoring their flight, and they texted just as I learned their flight was delayed. At first it seemed they might make their connection, but once airborne it was clear that the delay would prevent this. Before they landed I had contacted the travel supplier and identified possible alternate routing, and had learned that the airline had prospectively re-routed them for the same flight, next day. I had alerted their travel insurance carrier regarding the delay, and had information for booking a hotel for the night (and was standing by to make that booking.) Once they were in the terminal and had settled on their revised travel itinerary, I contacted the company scheduled to pick them up in Barcelona, and rescheduled their ride for the next day, and then contacted their hotel directly to ensure that their room would not be cancelled and, in fact, would be available when they did arrive the next morning. My lovely clients took the weather-related delays in stride, and enjoyed their "bonus day" in New York before heading out to Barcelona - to get in the spirit of Spain they attended a Miro exhibit (and caught a glimpse of the New York St. Patrick's Day Parade.) When I remarked on their turning lemons into lemonade, they responded "Lemons + Vodka = Limoncello!" Today they posted a lovely video depicting a live band and dancers, in a weekly event held in front of the cathedral just after Sunday Mass, to celebrate the Catalan Culture and independence movement. They are looking forward to a wonderful working holiday. Things happen - for all manner of reasons - and when they do, isn't it nice to have someone behind the scenes to help you work things out? Later this week I'm headed to LA for my first conference at Virtuoso, the consortia that my agency partnered with in January - conferences such as this provide a great vehicle for me to learn about what's new in the travel industry and to network with colleagues and suppliers - with the end result that I'm better positioned to provide great service to my clients. 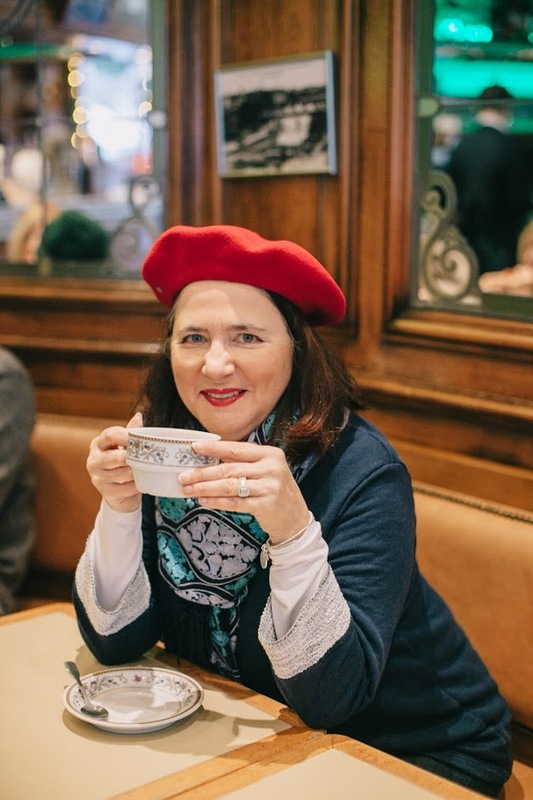 I've linked below my agent profile with Virtuoso - whether for personal or group travel, please let me know how I can help you create your next travel experience! What are you looking forward to as spring approaches? I know that many of you play golf, and also that many of you are interested in river cruising. Wikipedia says: “Golf, unlike most ball games, cannot and does not utilize a standardized playing area, and coping with the varied terrains encountered on different courses is a key part of the game.” Golfer friends of mine delight in playing courses new to them while traveling. But did you know that there are river cruise companies which offer rounds of golf as excursions during their European itineraries? How special would it be to combine a river cruise with hitting the links in totally new destinations? This article introduces a couple of options to do just that! FORE! PS - if you have golfer friends who might be interested in combining a river cruise with a unique golf experiences, please share this article with them! Thanks! The Concierge Golf Program is offered on 21 sailings during 2019 - and if not everyone is a golfer, not to worry - the daily activities offered on board are available for the non-golfers in your party. Of course when not on the course, you'll be staying in a beautiful floating hotel room as you travel between towns and villages, and be treated to excellent dining experiences and local beers and wines. If you are part of a regular foursome, or active at your golf club, think how much fun it would be to share an experience like this with your golfing partners? I would love to help you choose a river cruise - please call or email when you're ready to plan. Something Free in Waikiki? Absolutely! Aloha - today is a day that has been anticipated by many for a long, long time: Southwest Airlines is now selling flights from the 8 California cities to Hawaii; the new destination has rolled out with remarkable sale fares - and other airlines are matching the special rates. So if you've dreamed of visiting Hawaii (and chances are, you have!) why not contact me now to plan your visit to this American Paradise? 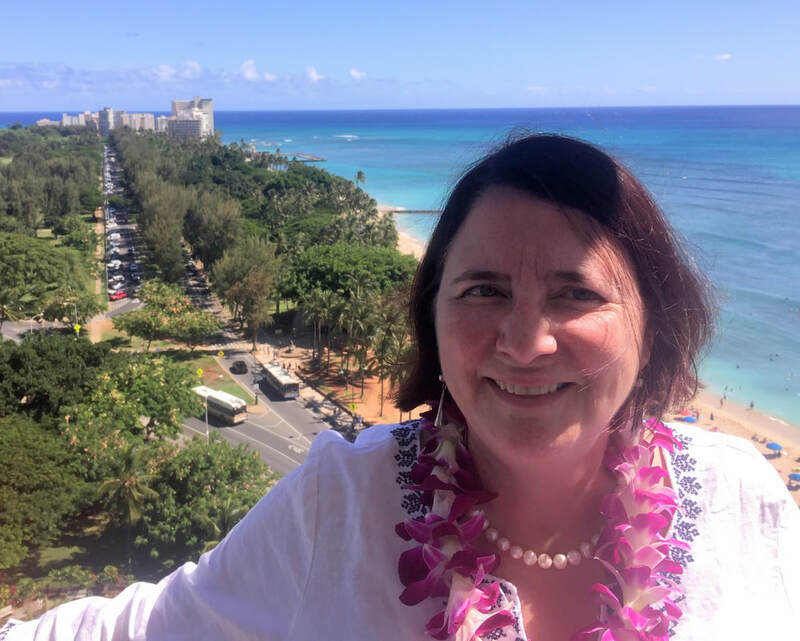 As a certified Hawaii Destination Specialist, I would be delighted to help you plan! Mahalo, JoanWith so many free things to do in Waikiki, there is really no reason to fork out a lot of cash on activities. From torch lighting and hula shows to hands-on classes in Hawaiian arts and crafts, this visitor “Mecca” has a lot of offerings to keep you busy – and entertain and educate at the same time! 1. Aloha Friday at the Hyatt Regency Waikiki - Each Friday afternoon, the Hyatt presents a Polynesian show with hula dancers, a Samoan fire-knife dancer and hands-on demonstrations of lei making and Polynesian art tattooing. Other afternoons during the week bring cultural classes like ukulele playing and storytelling...and you don’t have to be staying at the resort...although it is a lovely choice! 2. Kuhio Beach Torch lighting and Hula Show – Four nights each week at sunset, the blowing of the conch shell summons folks to the Kuhio Beach hula mound near Waikiki’s famous statue of Duke Kahanamoku. There, you witness a traditional torch lighting ceremony followed by an hour of free, feel-good hula by talented local dancers and entertainers. 3. Royal Hawaiian Band Concerts – Founded by King Kamehameha III in 1836, this one-of-a-kind ensemble serenades crowds with songs of the islands – past and present. Look for them each Sunday afternoon in the bandstand inside the 500-acre Kapiolani Park. The park itself is a fabulous free attraction, popular with picnickers and joggers. 4. Royal Hawaiian Center Classes & Entertainment – Take ukulele or hula lessons, learn how to make traditional Hawaiian quilts, weave a lei using fresh tropical flowers or try your hand at the art of lomi lomi massage, all at this multi-level shopping center. It also presents live music and hula shows most evenings...open to the public! See www.royalhawaiiancenter.com for schedules. 6. Wildlife and Fireworks at the Hilton Hawaiian Village – There’s no charge to watch the Hilton’s wildlife experts feed the penguins and turtles that live on its grounds. On Friday evenings, the resort presents visitors and locals alike with an Oceanside fireworks show, which is best viewed from the beach....a colorful and exciting way to have fun for free in Waikiki! 7. People-Watching – This is my own favorite pastime in Waikiki so I thought I would add it. Hawaii is a melting pot of cultures and you will see just about everything you could imagine – and more that you couldn’t even dream up! Visitors from Asia will be on the beach early in the morning practicing Tai chi and exercise...Street artists line Kalakaua Avenue in the evenings, providing some incredibly original “selfie” opportunities (don’t forget to tip!) and older couples in their matching Aloha-wear walk hand-in-hand next to surfers and goth-looking youngsters...Take it all in! Keep in mind that you don't need a passport to visit Hawaii...and rental cars are typically quite reasonable - another favorite activity is to drive the perimeter of the island, stopping as the spirit moves you - perhaps near Pipeline on the North Shore to watch daring surfers ride the huge waves - or sampling freshly prepared Garlic Shrimp and Shave Ice at the Shrimp Trucks near Haleiwa - or standing over the beautiful Waimea Bay - or driving Tantalus and Round Top Drive for breathtaking views, or visiting the Byodo Inn, a replica of a Japanese Buddhist Temple in the Manoa Valley... Don’t let the fear of “I heard Hawaii is super expensive!” keep you from planning that vacation! I am well informed on these, and many more, free and budget-friendly options to keep you going from sunrise to sunset! Just do it! SUPPORT A CHARITY OR LOCAL ORGANIZATION THROUGH YOUR RESORT, CRUISE LINE OR TOUR OPERATOR. I’ve referenced a group meeting for a conference supporting a local school via a connection with their resort – but there are potentially many ways to contribute. When I visited Cuba, our group leader contacted a religious group in Havana which operates a free clinic – they requested diapers, children’s underwear and over the counter medications. Every traveler in our group contributed to this cause. 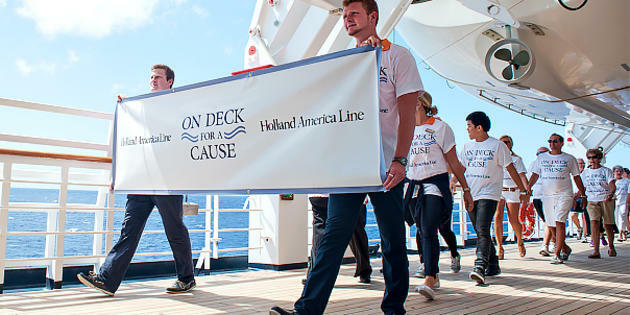 Later this year we will be sailing on a Holland America Cruise; every itinerary offers a 5k during a sea day, called “On Deck for a Cause” (pictured above) – cruisers donate $20 to participate and receive a tee- shirt; the organization raises funds for Cancer Organizations in the US, Europe and Australia and has raised over $6 million to date. Carnival Cruises has partnered with St. Jude Children’s Research Hospital with a program called “Care to Play” – funds are raised a variety of ways, but the most popular is donating $10 to participate in a special dance party called “Groove for St. Jude.” Royal Caribbean has partnered with the World Wildlife Foundation; guests can purchase special items in the gift shop with all proceeds being donated to WWF, or can sign up for either a Walk or Swim for Sea Turtles event for a set donation. Finally there is an organization called Pack For A Purpose which identifies in-destination groups needing donated items, and then encouraging travelers to fill unused space in suitcases with items to donate. SUPPORT LOCAL ECONOMIES - BUY HANDMADE CRAFTS OR OTHER ITEMS FROM LOCALS. You contribute to the well-being of locals when you purchase handmade items directly from them. In Mexico, I had the choice to purchase small woven bracelets made by local women or from a chain of souvenir shops catering to tourists. On Bora Bora as part of a shore excursion we saw a demonstration of the tie-dye process for the colorful swim coverups – and had the opportunity to purchase directly from the artisans. By purchasing these items, I demonstrated appreciation for the local customs and crafts, contributed directly to income for locals, and had some lovely pieces for friends and family back home.. Make the effort to seek out and support the local artists, wood carvers, weavers etc. with purchases which may be small for you but very meaningful to the craftspeople. PARTICIPATE IN VOLUNTEER TRAVEL. You may have heard the term “Voluntourism” which loosely translates to volunteering while you travel. By giving something back to the community you are visiting, You learn about another culture , city or country in a deeper, more intimate fashion. You donate your time, skills and knowledge, which benefit others and just may help your heart grow a few sizes. There are several tour operators offering volunteer opportunities during your travels; contact your travel advisor if you are interested in matching your destination with a volunteer opportunity. We are all busy and may not have a lot of time to give, but perhaps if we each look for some small opportunity, together we can make a difference. The next time you take a vacation, consider asking what you can do to help. We are happy to assist you in learning about these opportunities as you plan your vacations. Have YOU participated in a program that you would like to share? Let us know and we will put it "out there" for all to see! First, Travel Advisors help clients choose a destination and how best to experience it. 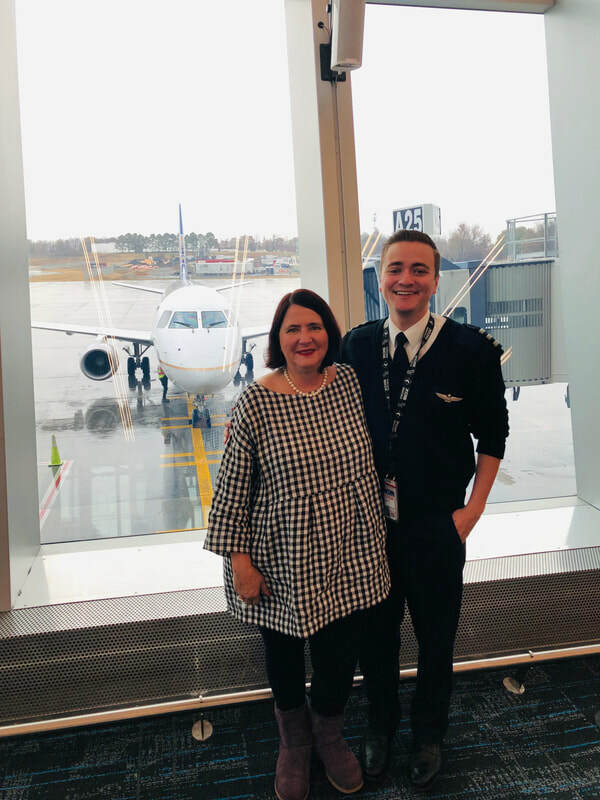 I’ve been to many destinations – but if not, I’ve got trusted colleagues who have, as well a host of research resources to draw on for my clients’ behalf. In order to match my clients with a great experience, I take time to get to know them. I hate to see people spend money on an experience they don’t enjoy, or have a subpar vacation, even if it was presented as a steal of a deal. Second, Travel Advisors save clients time and hassle. The Internet is called the Information Highway for a reason, but it’s a double-edged sword, and it may be difficult to know what's accurate. My knowledge and experience allow me to quickly assess available options. I love sitting on hold (said no one, ever!) – but as their Travel Advisor, my clients can outsource this time consuming and sometimes frustrating task to me. Third, Travel Advisors may be able to get their clients special treatment they can't find on their own. 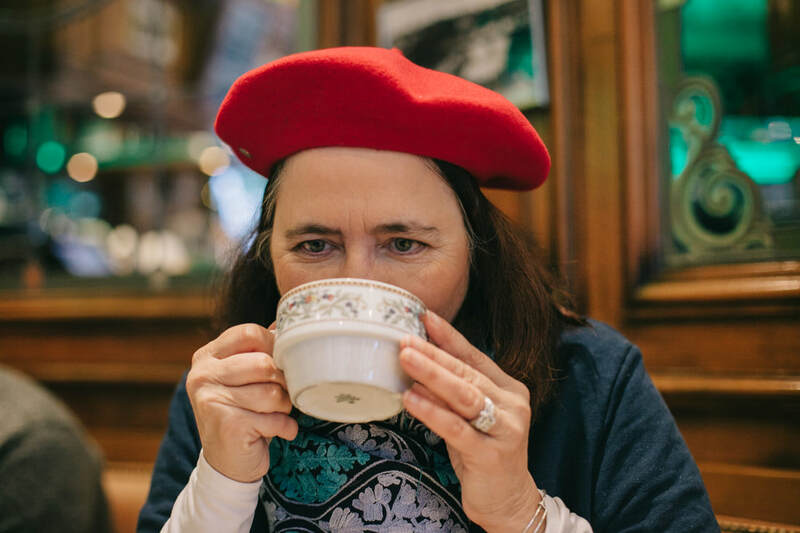 Thanks to my relationships with travel suppliers, I can often get amenities, upgrades and other special VIP touches that my clients don't have access to. So while some DIY vacationers may pat themselves on the back for saving $100, it’s not unusual for my clients to enjoy special perks worth more, and adding an extra touch to their experience. Fourth, the job of a Travel Advisor does not end when the client has booked travel. I go the extra mile to find great restaurants I know they will love and book reservations, recommend and book extra special activities (for example, golf tee times, shore excursions, food experiences, day trips out of city, etc.) I do my best to prepare my clients for travel, to minimize surprises. I confirm that passports are current (and whether visas or other extras are needed,) help them with packing advice, and even tipping guidelines. Fifth, Your Travel Advisor reads through the fine print, so you don’t have to. There are myriad rules imposed on the traveling public by airlines, hotel companies and tour operators, frequently resulting in fees for change or cancellation, as well as defining their obligation to the traveler in the event of an unforeseen circumstance, which might disrupt travel. I review this language and interpret terms and conditions for my clients, to assist them with making a fully-informed purchase decision. 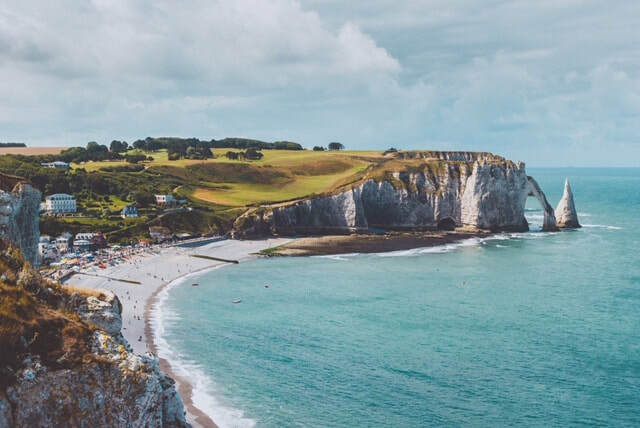 Additionally Travel Advisors have access to dedicated travel insurance companies with products that are often less expensive and more comprehensive than those offered by an airline or tour company. Bonus – Have you ever tried to organize a trip for a group of people? Traveling with a group (family, friends, people with a common interest, etc.) is a wonderful way to experience a destination but it can quickly become complicated. You can delegate planning a group trip to a Travel Advisor, who will track all travelers and associated bookings, payment deadlines, documentation requirements, etc. It’s not unusual for travel companies to offer special perks when a group travels together! Finally, your Travel Advisor is a phone call away. If my clients experience unexpected challenges during their travel, they know they need just to phone or text me, and I will work to resolve the issue. Have you ever sought help from one of the online mega-agencies? If so, you understand the value proposition here! I love going to the movies, and with London being a key player in so many of my favorites, I felt like I sort of knew the place when I first visited - and now when I view a film set in London I have a greater appreciation of the places depicted. Movies have such a powerful effect on our imagination, and in fact serve to influence many people by inspiring them to travel to their favorite movie locations. If you fancy going behind the scenes to see how the Harry Potter films were produced, Warner Brothers offers a studio tour experience just outside of London specifically called "The Making of Harry Potter." What’s your favorite movie set in London? Comment below. PS - I love Hugh Grant - so Four Weddings and a Funeral, About A Boy, Notting and Love Actually top my list - as well as the Sean Connery-era James Bond movies. And I love the sweet optimism of Bend it Like Beckham! Charles (Hugh Grant) is looking for The One in Richard Curtis’s sweet, soppy movie. The capital provides a picture-perfect backdrop as Grant and his band of twenty-something aristo-Londoners date, flirt and consider settling for sub-standard partners in an effort to walk down the aisle. Proof that spending every sunny Saturday at a friend’s wedding is not a modern affliction. London location Charles lives (and has that romantic, rainy reunion) on Highbury Terrace in Highbury Fields, the lucky sod. He also wanders along the South Bank and has a matrimonial meltdown at Smithfield’s St Bartholomew the Great. John Cleese hauled Ealing comedy legend Charles Crichton out of retirement to co-write and direct this acid-tongued shout-out to the classic comedy crime caper. Cleese plays a barrister (that’s a lawyer) swept up in a robbery plot; Michael Palin outraged stutterers worldwide as an animal-loving getaway driver; and two Yanks, Jamie Lee Curtis and Kevin Kline offer scathing observations on British life. London location The iconic scene where Kline dangles Cleese out of a window was shot at New Concordia Wharf in Bermondsey. Sir Conan Doyle’s sleuth gets a post-modern update, with Robert Downey Jr playing a beefed-up version of Holmes. London location Shot in and around London (as well as Liverpool and Manchester), Guy Ritchie’s London of yesteryear is a romantic place of heaving bosoms and ridiculously cool heroes. From the same makers as Love Actually, with Hugh Grant and Julia Roberts, Notting Hill is a funny, light-hearted fantasy romance that has its tongue pressed entirely in its cheek. London location: While not reflected in this film, Notting Hill is one of London’s most multicultural hot spots. The neighborhood looks the best it ever has – though Portobello Road is where you’ll find Grant’s bookshop. Renée Zellweger stars as the perpetually-single Bridget in this canny update of Pride & Prejudice. London location: Visit Borough Market and you’ll easily spot Bridget’s little flat near the pub, not to mention the restaurant that's the setting for the hilarious dust-up between Colin Firth and Hugh Grant. Two 18-year-old girls aspire to become professional football (soccer) players in Gurinder Chadha’s gentle comedy. London location: Chadha captures the city’s cultural diversity beautifully as Parminder Nagra rebels against her orthodox Sikh upbringing – with Hounslow providing the perfect suburban backdrop. The 1960s classic musical, in which young orphan Oliver falls in with a gang of street urchins who’ve been trained as pickpockets. London location: The city’s a smoggy place filled with danger in this movie adaptation of Dickens’ novel – you definitely believe a character like Fagin could live here. Sci-fi horror from Danny Boyle in which an incurable virus sweeps the UK, transforming people into ravenous zombies. Jason Bourne (Matt Damon) continues his hunt for answers while dodging the CIA. London location: Waterloo Station is a battlefield at the best of times, but it becomes a hustle-bustle setting for a fantastically tense action scene in Damon’s last Bourne film, as he attempts to protect Paddy Considine’s journalist. Joyous musical romp starring Julie Andrews as the Mary Poppins, who’s hired to look after two very unhappy children. A Bangladeshi woman arrives in London, leaving behind her family and friends. London location: Cultural diversity is all part of London’s charm, and here we get a look at the East End’s Bangladeshi community, where the aftershock of 9/11 is strongly felt. Eight films adapted from JK Rowling’s bestselling book series, with Daniel Radcliffe as the lightning-scarred boy wizard. Oscar-nabbing historical drama starring Colin Firth as King George VI, who struggles with a debilitating stammer. A 1998 British-American romantic drama film written and directed by Peter Howitt and starring Gwyneth Paltrow and John Hannah, while also featuring John Lynch, Jeanne Tripplehorn, and Virginia McKenna. The film alternates between two parallel universes, based on the two paths the central character's life could take depending on whether she catches a train, and causing different outcomes in her life. London location: The bridge featured is the Albert Bridge between Battersea and Chelsea. The late-night scene when Paltrow and Hannah walk down the street was filmed in Primrose Gardens (formerly Stanley Gardens) in Belsize Park. Oberammergau: Excited for Travel Planned 2 Years in the Future? YES! As a travel expert, one of my very favorite things is networking with my colleagues, and learning from them. While I had heard the term "Oberammergau," I had no idea what it was, until a friend, who specializes in Religious Travel, described in detail this once-a-decade spectacle that has been created and performed in the town of Oberammergau, Bavaria, Germany since 1634. Fascinated, I decided that my husband and I must experience this. Wikipedia explains that in 1634, a native of the town returned home for Christmas, infected with bubonic plague, which typically spread quickly and had a high mortality rate. The townspeople made a vow that if God spared them from the epidemic, they would perform the Passion Play every ten years. The scope of the epidemic was limited, and since then, with few exceptions, the inhabitants of the village have produced this spectacle every year ending in zero. The performances are staged in an open air venue, and the scripts and music have been compiled from material written during the 15th and 16th centuries. Over 2,000 of the town's 5,000 citizens participate in the event, performed over a five-month period in the designated year. This unique experience generates worldwide interest, with a corresponding great demand for tickets. Many tour operators offer trips including attendance at performances of Oberammergau, but these offerings consistently sell out well in advance - ergo my decision to plan really, really far in advance. Personally, for an event like this, my preference is to delegate the arrangements for tickets, lodging and transportation to a company with experience in handling the details to provide a seamless experience. We've chosen to take a Danube River Cruise which combines a land portion to take in the Passion Play; there are many options offered by multiple tour companies. If you too would enjoy a unique performance like this, I would be delighted to assist with (very) advance planning. I've attached a short video taken during the 2010 event - hope you enjoy! We arrived at Breathless, which is adjacent to the Marina, late in the afternoon. After getting settled in our rooms, we headed to one of the many restaurants for an elegant sunset supper. The next day was spent relaxing - we got up early and walked the resort, then had a lovely buffet breakfast, before walking through the marina (and buying a whole lot of beautifully embroidered polo shirts at a local shop.) The rest of the day was spent relaxing in the pool, and taking the "glass bottom boat taxi" to El Arco - one of Cabo's iconic spots. We looked into the "Sip, Savor and See" program offered by the resort, which offers guests the opportunity to have a meal in one of the sister properties - and received an unexpected offer - due to an overbooking situation, would we be willing to relocate to a sister property, in exchange for a future stay? What would YOU do? After figuring out the logistics, we were 4 thumbs up to this proposition. On Friday we gathered very early to meet our fishing boat at 6:30 AM. For deep sea fishers, Breathless is perfectly located, as the marina is literally at the foot of the resort. Our boat was upgraded from 28 to 33 feet, and we set out before the sun was up. As you sail out of Cabo, there are small rowboats actively catching bait fish with nets; they row up to your boat and hand over a bucket of (mostly) live bait. Once you are past the rock formations, the first mate sets the lines - typically there are at least 4 lines with lures, and an additional "streamer" line intended to attract the attention of the fish. When we fished in March, we caught several skipjack (a type of mackerel) as well as two yellowfin tuna. September is a different season, and within the first 90 minutes we had caught 4 Dorado - also known as Mahi Mahi or Dolphin Fish - a beautiful yellow spotted fish with a blue sail. And then the fun began. Our captain and mate were constantly scanning the ocean, and when they spotted the marlin, they jumped into action. They saw it leaping, and started "chumming" the water by tossing bait fish in to attract the marlin. AND IT BIT! The line with the hooked marlin was handed to our travel companion, an accomplished lake fisherman. It was thrilling to watch; the marlin was initially very close to our boat, but the fish ran - our friend was reeling in while simultaneously the fish was pulling line out. An interesting physics lesson! He fought the fish for 57 minutes before the line snapped - although we had no intention to keep the fish, it was still disappointing to not get it closer to our boat to document. BUT - within ten minutes of that broken line, we hooked a SAILFISH. This fish snapped the line within 10 minutes. After this we hooked nothing - but we were not alone - our captain was on the radio with his colleagues and nobody was catching ANYTHING. So after 7.5 hours on the water, we headed back to the marina, where a man with a big blue bucket took away our catch, and for $3 each dressed our Dorado into fish filets, which we put on ice to take to the next hotel, Secrets in San Jose del Cabo. Breathless is a 5 story complex on the marina with a party vibe - but Secrets is 30 km south, in San Jose del Cabo, with much more of a traditional resort feel. The rooms were very different - much more spacious with hacienda-type furnishings, and a beautiful oceanfront setting. We left our iced fish filets with the concierge to be prepared at the Italian restaurant, with a dress code (!) We opted to have the fish prepared in the Chef's special preparation which was SPECTACULAR. All four of us were exhausted after the long day on the boat so we literally fell into our very comfortable beds. The next day the Marina turned out to be closed, due to Hurricane Norma lurking not too far away, so we had a lovely day at the resort - with a lot of time walking the grounds, doing the aerobics in the pool, and checking out the talents of the pool bartenders. NB: an iceberg, consisting of a glass of beer with a bit of frozen margarita on top, is not too bad! We had dinner that night at the nominal Mexican restaurant, although the menu was not really Mexican. Next day we scheduled a day trip to Todos Santos. On the way we stopped at the El Cactus Glass Factory in Cabo San Lucas - it was a Sunday, so the artisans were not demonstrating their technique - but the grounds and shop were absolutely lovely and are well worth a visit. Our plan was to revisit several spots we had seen in March, including lunch at Tequila Sunrise...but after a lovely drive to Todos Santos, we found the restaurant was closed that day. No Worries - we took a walk around the town, then settled at the Hotel California for a lovely lunch. During lunch, a young man set up a kick pottery wheel in the courtyard, and proceeded to create lovely recreations of the hotel's fountain, all for tips. We headed back to our hotel to prep for our return home.